On May 18, 2018, Frog Eyes will release their final album—Violet Psalms. After 17 years, the band is calling it a day. When Carey Mercer announced to the fanbase that this record would be the last act, those in the know took notice. Frog Eyes aren’t the type of band to hang it up only to prepare for a reunion and nostalgia tour. Those that know Mercer, and know the band, understand that this is it—it’s exit stage left and done. Mercer has always been a treasure from the great white north. Whether it’s fronting this dynamic band, or providing the backing band for fellow Canadian eccentric Dan Bejar‘s Destroyer project on the album Notorious Lightning & Other Works. Mercer and Bejar also joined forces with another hometown Canuck, Spencer Krug (Wolf Parade), to form the supergroup Swan Song. On one of the new tracks, “Little Mothers,” Mercer sings, “Everything changes / I see things in stages / Stages and stages.” That is exactly how Mercer thinks. Through his whole career, he has moved from one stage to another. 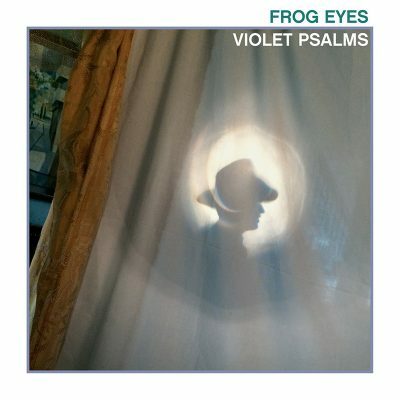 Violet Psalms is no different from other Frog Eyes projects. It’s beautifully complicated, creative and strange. Mercer and Frog Eyes bunkered down in his basement to record this album. The current version of the band consists of his wife, Melanie Campbel (drums), Terri Upton (bass) and Shyla Seller (keyboards, synths). You can sense Mercer’s touch on just about everything. The rhythm section expertly starts and stops on Mercer’s vocal whim, and every note seems to be perfectly placed and all silences delicately planned. Mercer’s guitar work crackles and scrapes, rattling in and out without taking over any of the songs. Like most Frog Eyes albums, it’s the voice that’s out front. Mercer has a voice that reaches and falls in vocal register—high one moment and low and scratchy the next. Mercer can shout at you at the beginning of a song and whisper you out at the end. At times, the voice eerily sounds like David Bowie, A highly anxious version of the starman in reverse—grounded on the earth with post traumatic stress disorder. Violet Psalms works in many ways, but it works best with repeated listenings so that the calculated madness can set in. Not only does Mercer spin you around with his unique vocals, but he completely turns you inside out with his absurdist poetry. “All I want is a sign / All I need is a sign / That I’m sound of mind,” he sings on “Don’t Sleep Under Stars.” A sound mind that turns around and delivers a line like “What part was you / What part was me / It was not me / See I live by the sea / Intelligent and free / Chained to the Warden’s son” on the track “Sleek as the Day is Done.” These theatrics continue with songs about an ideal man (“Idea Man”), world politics (“On a Finely Sewn Sleeve”) and an acid trip (“Itch of Summer Knees”).